Here's a small selection of books that should suit most tastes. From the best pub grub to Iron Curtain cars and Formula One champs Red Bull Racing. UK pub grub gets the taste treatment from Michelin's famous foodies. The guide covers 534 pubs, ranging from city centre gastropubs to remote country inns. It's not just a food review, either. 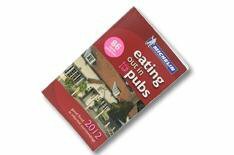 The Michelin Guide includes maps and written directions to help hungry motorists find their pubs of choice. Unlike most Haynes manuals, this wont end up covered in oily fingerprints its a fascinating insight into the world behind the 2010 double championship-winning Red Bull team. Featuring behind the scenes access to the processes involved in building a racing car, this is a must-have book for any Formula One fan. Prior to the fall of the Iron Curtain, the Eastern European car industry was a mystery to many in the west, and so it would have remained if not for Andy Thompsons Cars of Eastern Europe. The book takes a drive through Communist Europe on a country-by-country basis and shows theres a lot more to it than just the infamous Trabant.